When I was a kid, I loved ordering books from the Scholastic book club. In addition to some exciting books, purchases over a specific amount would result in a free poster. This poster from 1980 is one of my personal favorites that I hung in my bedroom for some time. I was surprised to find it in an old stack of papers in the garage. On the backside is a description of the 10 mythical creatures pictured. What a great poster for a kid interested in Greek Mythology! In doing a little research on the artist, I discovered the artwork is by Carlos Victor Ochagavia who created the original covers of the Illuminatus paperback books. Can anyone name the 10 mythical creatures pictured? All three novels in The Illuminatus! Trilogy came out in 1975. See Ochagavia’s striking covers here. 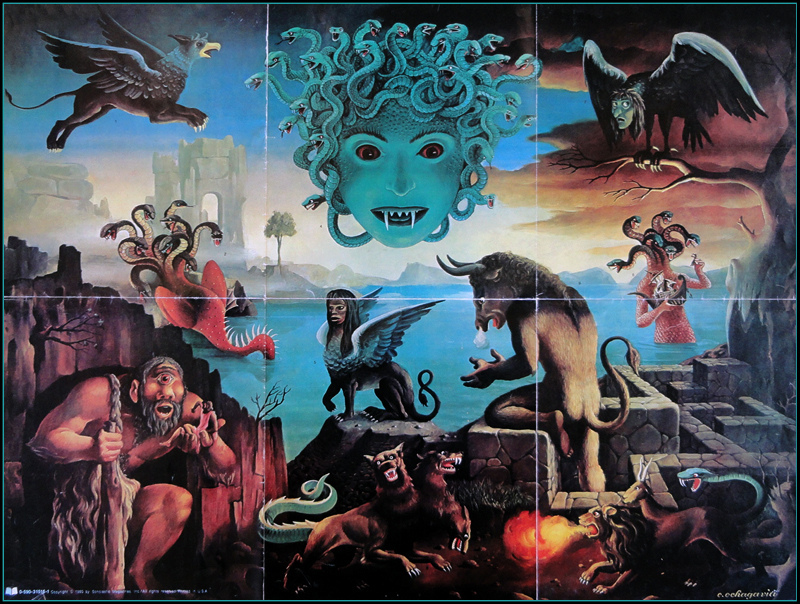 Griffon, Medusa, Harpy, Hydra, Sphinx, Scylla (note the six heads & the ship), Cyclops, Cerberus, Minotaur, Chimera. Although, technically, the Medusa might be called a Gorgon. Show off. At first I thought Scylla was Cthulhu. Yarrgghh I should’ve made my guesses before looking at the comments. Oh well lol. I would’ve only gotten like 3-4 of ’em anyways. Super awesome Gorgon. I like how she’s totally smiling too. I want that on a shirt. Totally reminds me of all those Sinbad movies. So cool that he still has this classic poster! Wow, had that as a kid, right around the time I discovered Dungeons & Dragons. Is it possible to still find this legendary poster? I’m collecting all the things I lost as a small child and this poster is one of them. If anyone has one for sale at a reasonable price, I’d like to do business with you. arly 80s. He recently reminded me about the poster and I couldn’t recollect it but we both said how much we would love to have a copy again. DO y Would pay a tidy sum for a decent copy. not sure what happened to my reply but basically I MUST have a copy of that poster!!!! Very important to me and my brother! If anyone know how I could get one, please contact me!